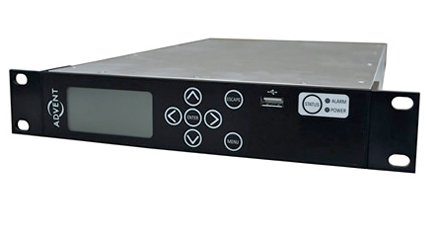 [SatNews] Vislink International will be launching its Advent DVE5150 encoder at CABSAT 2014, March 11 – 13 in Dubai—this latest addition to the Advent 5000 series, the DVE5150 has been designed to offer greater flexibility to broadcasters for news gathering and video contributions, and is ideal for use where space and weight are at a premium. The DVE5150 is a highly flexible and modular unit that can be customized to meet the individual needs of a broadcaster. Built with a single H.264 encoder, the DVE5150 provides a more cost-effective solution for broadcasters who do not require MPEG-2 support or an in-built modulator and instead are only looking for additional encoder functionality. As part of Vislink’s modular approach, the DVE5150 can be upgraded to include dual encoder support. There is also an option to include a four-way COFDM diversity receiver within the same chassis, giving broadcasters full support for IP streaming. The DVE5150 can work alongside an existing encoding setup or as part of a Vislink wireless camera system. The Advent 5000 equipment range not only includes encoders but modulators and antenna controllers. The DVE5150 also complements Advent’s broader range of fixed and portable point-to-point microwave broadcast equipment as well as Vislink’s portable and rugged MSAT data terminal, which is ideal for first on scene satellite news gathering.